A world of spies, invention, battles for power, and secret societies. A brilliant scientist, Christophe Creangle, is plagued by his inner struggle to not make any inventions that can be turned into weapons, unfortunately he is one of the greatest inventors of all time. Inventors are known as Conventioneer’s in this world and they are governed closely by whatever ruling body they happen to reside in. All inventions are turned over to the ruler in order to help protect and build their power base. After escaping from the king and his men, Christophe searches for his daughter. His daughter Christina inherited his sharp mind but after years of separation their relationship is strained. A young girl named Mounira acts as the go between for them and together the three of them reside in the Moufan compound. The Moufan however, is going through a power struggle and change; what use to be a neutral community is becoming a dominate power through force. 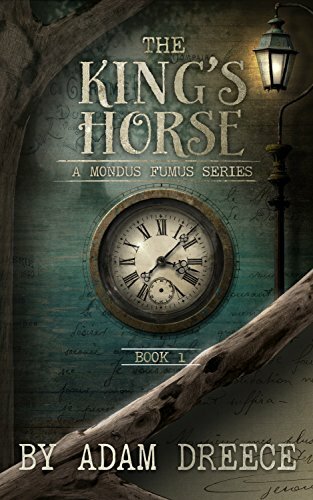 Adam Dreece has continued his saga of his created world, the Mondus Fumus, with a new series called The King’s Horse. While there is some character and history tie back to his original series, The Yellow Hoods, this novel stands alone and is ready to introduce readers to the world he has invented. Adam Dreece describes his world as a combination of steam punk and fairy tale. 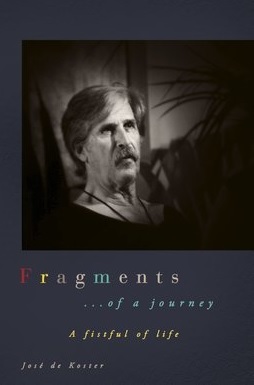 This novel sets up the series providing background to how key players got to be where they are. Through back and forth timelines we get the history of Christophe Creangle, his inventions and how they have helped shape the world he lives in. We also learn why his relationship with his daughter Christina is so challenging. This is probably the one part of the book I dislike. There are multiple time lines following several story lines that all intertwine. Given the complex character development I would have preferred it to be chronological. Aside from that distraction of having to make sure you were reorienting yourself to the right time period, the separate story lines were well connected to make sense in how they all fit together so you don’t feel like you are reading a bunch of separate novels. I really enjoy the world that Adam Dreece has built in this series. It is like reading about the industrial revolution with a fantasy twist taking place during medieval times. It is a bizarre and enticing mix of elements that draw you in and take you out of reality. While giving the reader this mix of elements, the characters are highly complex, and you learn more and more about them with each chapter. While some of the characters like Rumpere are easy to identify as the “bad guy,” others are much more discreet, and you are left wondering where their loyalties lay. The characters of Oskar and Petra, a brother and sister duo, at times feel like filler, but as the story progresses you see their importance coming into perspective. Overall this novel is a great set up to the series. I look forward to reading the rest of the series and seeing how all the twists and turns change and to see what the real end game is. The characters come to life and draw the reader in, you almost think you know how some will respond and when they don’t you are left turning pages to find out what happens next. Posted on July 12, 2018, in Book Reviews, Four Stars and tagged action, adam dreece, adventure, alibris, author, author life, authors, barnes and noble, book, book club, book geek, book lover, bookaholic, bookbaby, bookblogger, bookbub, bookhaul, bookhub, bookish, bookreads, books of instagram, booksbooksbooks, bookshelf, bookstagram, bookstagramer, bookwitty, bookworks, bookworm, ebook, fairy tale, fantasy, fiction, goodreads, ilovebooks, indiebooks, industrial, kindle, king, kobo, lgbt, literature, medieval, mystery, nook, novel, publishing, read, reader, reading, royalty, science fiction, shelfari, smashwords, steam punk, story, suspense, the kings horse, thriller, writer, writer community, writing. Bookmark the permalink. 1 Comment.